Great quality! The set was nice quality fabric, and the color is a nice rich gray. This is an excellent buy for you, or a great expensive looking gift. Makes your room feel look like 5 star hotel. Sharp and sophisticated this comforter has a geometric pattern. Available in full, queen and king sizes, the set is machine washable for convenience with a hypoallergenic material. Dimensions 22.0 In. X 17.0 In. X 13.0 In. 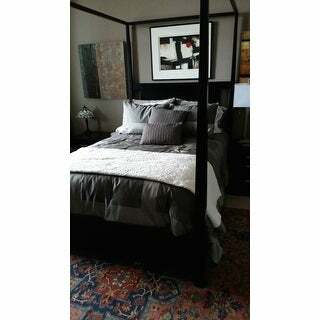 The comforter looks great on the Queen bed. The pillow cases and the extra decorative pillows are very nice. Great purchase! I will definitely buy more Jacquard comforter sets again in the future. This is great. Nice weight, great fabric. Classy design. Once cording all around and a flannel-like backing that makes it non-slip. Terrific value--and American made! Comfy Bedding jaquard 5 peice comforter set in color of Plum was just the perfect color I needed to complete the look in my guest bedroom. Liked the quality of the set it is ,a little shiny (polyester) But still looks rich. Color is vibrant. Unfortunately the pillows shown on website in plum were not what arrived with the comforter set. Customer service team was efficient sending out replacement which once again arrived with DARK GREY ACCENT PILLOWS. I eventually returned set after several attempts to secure plum accent pillows and the website photo has been updated. Nice quality for the money. I was disappointed with the length of the sides. It could be at least 6 inches longer. Great, modern design makes this bedspread perfect for a man/woman, young or old. The design is bold, but not over the top due to the monochromatic color-on-color design. The material has a slight sheen that adds texture and interest. The pieces allow for a complete, high-end look. Very happy with this purchase. The comforter set was purchased for my 23 year old daughter. She loves it and all her friends who visit her apartment also loves it. The quality of the fabric is also a plus. It's a hit with millennials! I thought the bedspread would be a darker gray in the squares. Overall isotherm grays are lighter than the picture. It is a great comforter though and fits my queen bed perfectly. Overall I am happy with it! Comforter arrived as promised and descried. Good quality. I purchased the red set and the color in the picture is spot on. Quality is good, but it looks cheaper than the picture shows. The darker grey squares do not look that dark. Its almost a solid silver color. Soft and comfortable. The pattern is subtle and I like that. Very good value with all the cushions and accessories. If there are more colors, I would probably buy another set. I love this comforter!! It was exactly what I was looking for in the pictures and when it arrived at my house It was exactly as the pictures showed. Very thick and elegant looking comforter. It is perfect really glad I purchased it. Highly recommend it!! Excellent, just what I wanted! "It is rather deceptive because some of the items in the photo are apparently not included. I'm trying to figure out what's included and what's not. Thank you." This includes: Comforter: 86 inches x 86 inches. 2 Standard Pillowcases: 20 inches x 26 inches. Square Decorative Pillow: 12 inches x 18 inches. Rectangle Decorative Pillow: 18 inches x 18 inches. Can you say which ones in the photo? The quilted ones. Also it appears there is a quilted coverlet... I imagine that is not included. "Don't you have the answer where it is made?" "Under the detail section it said it is from China yet one reviewer said it was American. Where was it made?" 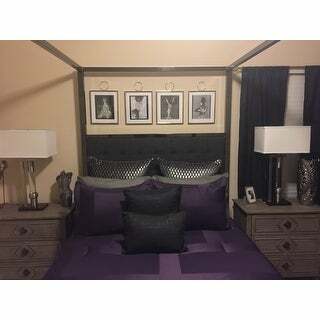 "Where can I find the other pieces in this collection - the decorative pillows and the quilt shown with the comforter set in the photo? I cannot find them on the Overstock site." Unfortunately, we do not currently carry the items. "I recently purchased this comforter in gray (it hasn't even arrived yet, so very recent), but I was wondering if you also sell matching curtains?" Unfortunately, we do not currently carry matching curtains. "I would like to purchase the plum comforter set. But I’d like the black sheet and pillow covers as well. Do you sell these separately?" "Is this set suitable for platform bed"